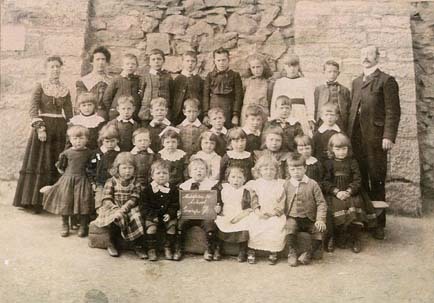 I have a little bit of info about the photo (1903) of Middleton school that I sent before, which is already on the site. I am pretty sure that the young girl in the dark coloured dress fifth from the right hand side of the  photo in the back row is my grand mother Mary Annie HALLOWS who was born in Middleton by Wirksworth 27 Sep 1891 and baptised there 22 Nov 1891. I have another photo taken on her parents silver wedding anniversary in May 1908, when she would have been 16 nearly 17, and the resemblance is marked. My grandmother said she left school at 14, I know she had a job later at Wirksworth Station which is where she met my grandfather, William Franklin who was a porter there. My mother Gladys Franklin now 78 also went to Middleton School, she remembers a teacher there called Mr Snow. Also on the 1906 photo, the young girl 3rd from the left on the second row looks very like Hannah HALLOWS the younger sister of Mary Annie. I can't find her on the 1903 but perhaps she wasn't at school that day. Hannah was baptised 28 Aug 1895 in Middleton. Again she much resembles Hannah in my 1908 photo. I always had the impression that Hannah was prone to illness, she died in 1944 on my mother's wedding day.